As it faces daunting challenges that have built up over decades, Boston Public Schools is embarking on a major transformation. Over the course of the next decade, the $1 billion “BuildBPS” plan will remake the district’s physical footprint inside and out. The plan, long a priority for Mayor Marty Walsh, will also change the way students move from school to school and from home to the classroom. That means around 10 percent of the district’s 125 schools can expect a totally new learning space at the end of this drawn-out process. But nearly all students throughout the city can expect to feel some of the ripples of BuildBPS. Here’s how the district is proposing to solve its structural problems, and what’s likely to change. Officials routinely mention that two-thirds of BPS buildings were put up before World War II. And a 2017 analysis performed by an architectural firm found that they’re showing their age. That analysis judged that the acoustics, air quality, and building ventilation to be “poor” or “deficient” in about half of those buildings, for example. About a third of Boston’s own capital spending on BuildBPS — around $190 million — will go to deferred maintenance, which Perille said had reached "crisis proportions" in some schools. It will also pay for tech upgrades and other improvements throughout the district. An additional $13 million will go to buy “21st-century furniture” — chosen from a ‘menu’ by schools — that’s mobile, ergonomic, or may better suit students with disabilities. The process will end, officials hope, with safe, modern learning environments — and the end of the ‘egg-carton’ classroom. 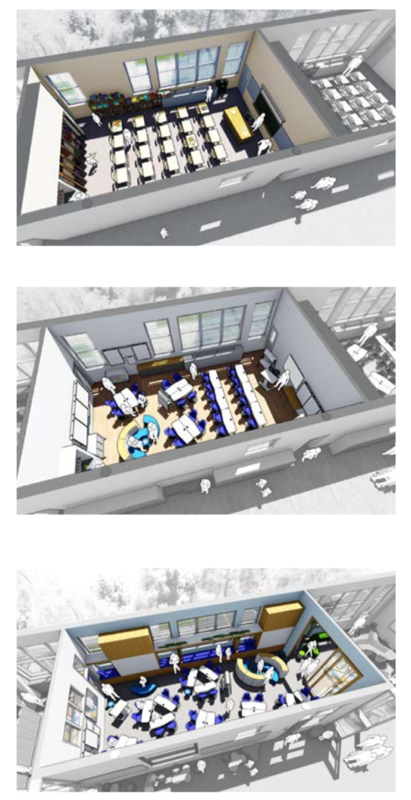 An artist's rendering comparing 20th and 21st-century classrooms from the BuildBPS report. That annual spending has already begun, and is expected to be completed by the 2022 fiscal year. Nate Kuder, a top financial official for the district, said he hopes the annual spending will take the district from "a place where people feel like they're constantly having to call or make noise in order to get the repairs that they think are necessary to a place where every school knows when they can expect to see window upgrades, roof upgrades, bathrooms — those type of systems upgrades that we need to be continuously repairing." As you might expect, that part of the plan is mostly uncontroversial. As always, the controversy begins when schools are moved, reshaped — or closed. Boston may be growing again, but BPS enrollment is still in long-term decline. It's down 12 percent since 1994, with much of the drop attributable to expanding charter schools. 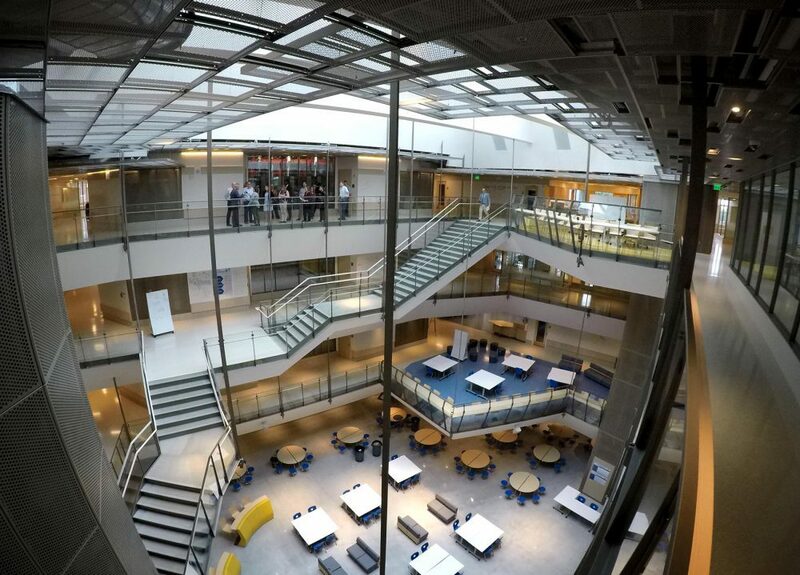 In 2015, an audit conducted by the consulting firm McKinsey & Company found that the district had almost twice as much space in its 135 buildings than it had students to occupy it. It suggested ‘right-sizing’ the district by closing or consolidating between 30 and 50 schools. The BTU and activists immediately disputed the McKinsey results, saying that its flawed methods led to a “wildly inflated” estimates of excess capacity — acting as if a gymnasium could serve as multiple classrooms, for example — and that those estimates were a pretext to close schools. In emails obtained by the parent organization QUEST, district officials weighed the potential savings of mass closures against the unappealing optics. “We are not using [the word] ‘close’ anywhere,” wrote then-BPS chief of staff Makeeba McCreary to a colleague. In the end, community resistance — and a revised capacity estimate — led to the scuttling of any wave of planned closures. The BuildBPS plan is tangling with the same issues raised in 2015. But its rhetoric around ‘right-sizing’ is more nuanced. The ‘Phase II’ report proposes adding new elementary school seats in underserved neighborhoods in the southern parts of the city that are expected to grow, including Roxbury, Dorchester and Mattapan. But it also gestures vaguely at the need for “program and building utilization plans” in neighborhoods with excess building capacity, such as Charlestown or Allston-Brighton. 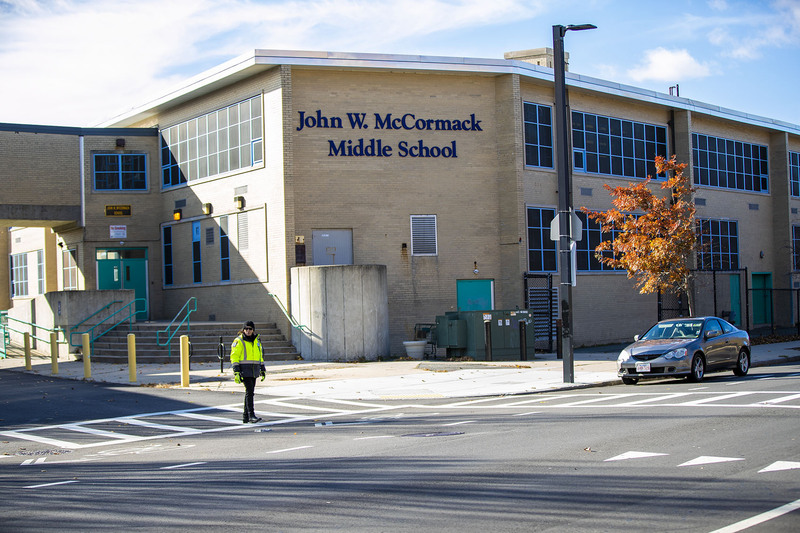 The only planned closings laid out so far are of the McCormack Middle School on Columbia Point in Dorchester and of the two high schools schools in the West Roxbury Educational Complex (WREC). The district has pitched the WREC closures as an emergency measure: This summer, city inspectors found that the WREC building had become unsafe, due to “water migration” through the building and a crumbling roof. Still, in a reminder of the prickliness of closures, WREC community members have resisted ahead of a Dec. 19 vote. Officials have said they lack the space to move the WREC students en masse to another building. But they pledged to keep WREC's rising seniors, as well as its special-education communities, together as cohorts next year. On another key question, the latest BuildBPS report expresses more explicit alarm: Boston's many small schools. There’s one BPS school for every 446 students enrolled in the district. That ‘average school’ is a good bit smaller than those in other urban districts, like Philadelphia (596 students), Chicago (580), and New York (611) — and that means losing out on economies of scale. To quote the ‘Phase II’ report, “on a per-pupil basis, small schools cost more and have less diversity of programming than larger schools.” More schools means more buses, more ancient boilers and leaky roofs, and more administrators to oversee it all. “All these [costs] represent resources pulled away from the classroom,” the report continues. Other than a planned new building, the BuildBPS plan is sketchy about solutions on this point. Many existing elementary school buildings are simply too small to fit more classrooms. Former superintendent Tommy Chang often mentioned the more than 20 different grade configurations present in Boston. The resultant mess of 'pathways' adds more uncertain transitions for students even as it complicates planning for families and for district officials. And it's had unintended consequences: Students tended to leave K-8 schools early, for example, in order to enroll in high schools that start in the seventh grade. The biggest loser in the pathway problem was the district's dwindling stock of standalone middle schools (grades six to eight). Only six such schools remain, and their enrollment has dropped by 43 percent since 2011. BuildBPS hopes to rationalize that jumble — first, by what Perille called the "phase-out" of standalone middle schools in favor of K-6 elementary schools and high schools that run from grade seven to 12, as do high-performing exam schools like Boston Latin School and Boston Latin Academy. District officials cite a body of research that suggests that students find the transition to middle school especially difficult, with academic setbacks to show for it. But BPS’s bibliography also includes evidence that other districts are doubling down on K-8 schools, on the theory that 12-year-olds don’t always thrive in high-school settings. 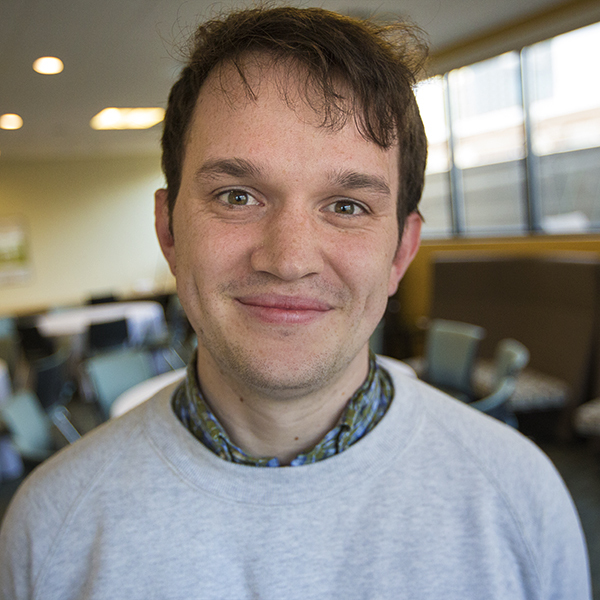 Meanwhile, neighboring Cambridge is reinvesting in middle schools — and the feeling of safety they may give during a sensitive time in students’ development. That said, even if Boston wanted to resuscitate its middle schools, it would be difficult to do so, given their decline in recent years. In community meetings, Perille has highlighted what she calls an 'equity emergency' for the district. "Fifty-six percent of our highest special-needs students — those in specialized programs — are concentrated in five of our more struggling open-enrollment high schools," Perille said. "Of those five high schools, three of them also serve the largest concentrations of our English learners." Those open-enrollment high schools don't require exams to enter. 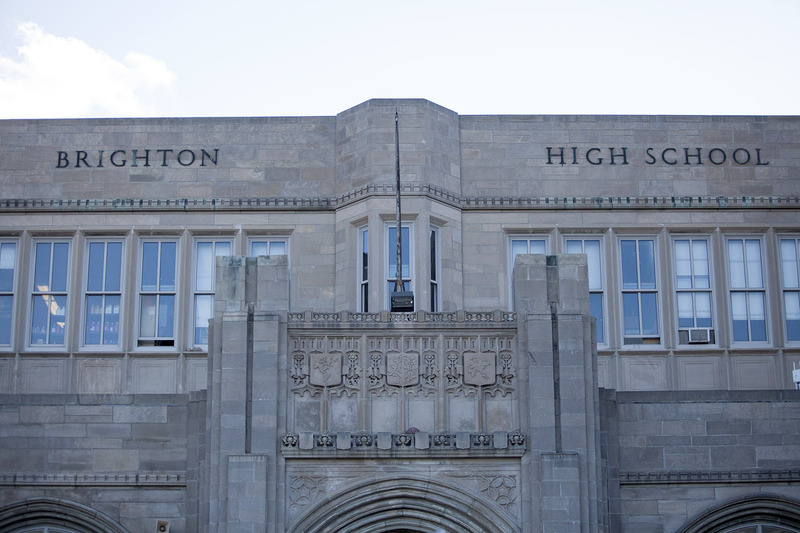 But as a result those schools, like Brighton High, have become the 'have-nots' to the exam school's 'haves' — experiencing shrinking enrollment, dropping state ratings, and overworked staff. Brighton High's enrollment has shrunk by more than 40 percent since 2011 — but the percentage of its remaining students who are English learners, economically disadvantaged, or have learning disabilities has only grown over that same period. During that period, the school dropped from the 19th percentile of comparable schools in terms of academic performance down to the second percentile. BuildBPS has a response to that problem: it "proposes to expand the placement of special education and English learner programs across a larger number of schools, including schools that have selective admissions," as the latest report reads. Breaking up concentrations of the district's most vulnerable student populations may help Brighton High reverse its current downward spiral and fend off further interventions by state officials — including a possible takeover — dreaded by the mayor and other top figures in Boston. On all these points, Perille said, BuildBPS represents "a singular opportunity for us to break the kind of structural barriers that have led to the challenges" in our schools. That opportunity was born of what she now calls a slow-rolling "crisis" in building and planning a safe, equitable and comfortable network of schools, each with its own character, aspirations and needs. It remains to be seen what BPS will make of it — but they've got high hopes.